These days, if I hear the word ‘Cthulhu,’ my ears perk up and my salivary glands kick into overdrive. It seems I simply cannot get enough of the tentacled Old One, in any shape or form. As such, I’m a huge sucker for Cthulhu fiction. I never tire of seeing where authors can take this beloved (if such a word is applicable here) Lovecraft creation. Today, I am honored to present Cthulhu Fhtagn!, a collection of dark stories that Lovecraft himself would be thrilled to read. If you are a fan of terrifying short stories, this is a book you will want to pick up immediately. For those of you not versed in Lovecraft, the words ‘Cthulhu’ and ‘Fhtagn!’ are uttered in a chant in his famous 1926 story The Call of Cthulhu. Many scholars believe the phrase refers to the dark god sleeping or waiting…but editor Ross E. Lockhart has a different theory. 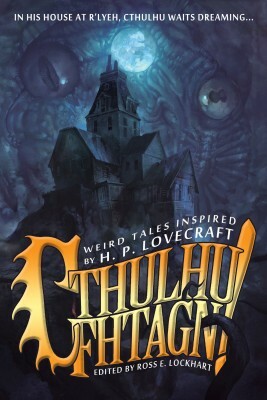 According to information shared with him in a dream, the term actually means Cthulhu’s House, or more precisely, ‘the house of Cthulhu.’ While I’m not sure about this translation, I am positive the stories within this tome are excellent in every way and worthy of your attention. The stories in Cthulhu Fhtagn! are carefully constructed and well fleshed out. Most are written in a style similar to Lovecraft’s own: lengthy exposition that is interjected here and there with dialogue. This is not a negative, either. In fact, it is a nice homage to the legendary icon who many consider to be the founding father of the modern horror fiction age. I enjoyed every story in this collection, which is a rare feat. Most anthologies I read usually have a couple (if not more) of stories that were just so-so, but every tale in Cthulhu Fhtagn! is entertaining and kept my interest. This is a true testament to the talent contained within these pages. One of my favorites is “The Lightning Splitter” by Walter Greatshell. In this story, a man’s new home contains a hidden passage to a horrifying place. Unfortunately, once you find this secret location, your life will never be the same. I love how this tale played out, as I didn’t see the end coming. Cthulhu Fhtagn! is a major win for me, and I highly recommend it. The authors work hard to continue Lovecraft’s dark legacy, and their commitment shows in the excellence of their stories. The book is available now in a variety of formats, so give it a look.